The film looks back at the show, but what I found most interesting were the glimpses into the man, revealed through the history of the show and also interviews with those who knew and worked with him. Daniel Tiger was most like Fred, especially as a child — Daniel can be insecure and inquisitive. Fred also could be like King Friday — sure of himself, almost to a fault, which can be grating. The film showed the magical world he created, including the land of make-believe, and the simple yet important lesson of listening and talking with children, as if they understand more than many adults think they do. Fred thought that love was the center of everything, “love or the lack of it.” The film showed how he was concerned with treating everyone with respect, even though he was reticent to acknowledge the sexuality of one of his “neighbors” who was gay, worried it might cause the show to be taken off the air (back in the day). The most illuminating reveal, though, comes near the end. Mister Rogers, who tackled racism, Bobby Kennedy’s assassination, and a slew of other topics that are difficult but important, that affect children and should be talked about, was asked to do a short piece a year after the September 11th attacks. The film reveals that he basically questioned what the point of it would be — after all the years of focusing on kindness, evil things still happen. That relatable moment — wondering what difference a single person can make — made this magical yet simple man even more human. I think everyone’s had moments like that. I know I have — several years ago, Do They Know It’s Christmas came on the radio. The song, from 1984, aimed to raise money to end hunger in Africa. Thirty years later, the problem still exists. I had the same thought he had — what’s the point of me, a single person, trying to change the world if the bad never ends? Won’t You Be My Neighbor has become the top-grossing biographical documentary of all time. Directed by Morgan Neville, who won an Oscar for Twenty Feet from Stardom (an enjoyable documentary about back-up singers), the Mister Rogers documentary is a fun trip down memory lane, and a good reminder about courtesy, listening, playfulness, and kindness (the latter of which we could use more of these days, eh?). 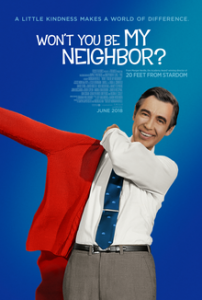 Won’t You Be My Neighbor screens on HBO and PBS on Saturday, February 9. It’s worth the trip on the neighborhood trolley to see Fred and the gang again. P.S. Bring tissues. I loved Mister Rogers! He was from the same area of PA where I grew up. What a gem!